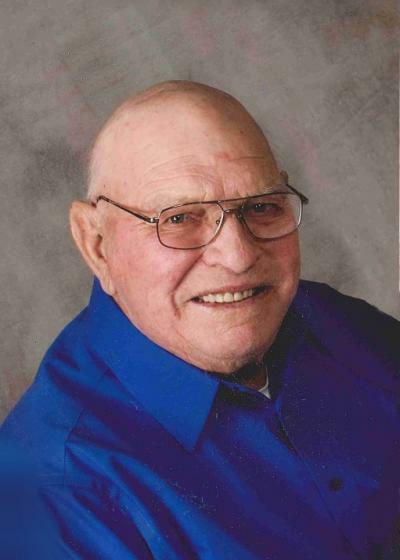 Arnold Gustav August Schauer, 84, of Glencoe, died Tuesday, Feb. 23, 2016, at Abbott Northwestern Hospital in Minneapolis. Honorary casket bearers were Mr. Schauer’s great-grandchildren, Ava, Maddox, Isaac and Easton Wisch. Casket bearers were Mike Schauer, Michael Cooley, Dan Rettmann, Robert Schuft, Cory Schiroo and David Cohrs. Interment was in the church cemetery. Mr. Schauer was escorted to the cemetery in his 1958 Farmall 450, driven by Ken Schiroo. Arnold Gustav August Schauer was born July 7, 1931, in New Auburn Township, to Henry and Lydia (Bullert) Schauer. He was baptized as an infant on July 19, 1931, by the Rev. Dysterheft at St. John’s Evangelical Lutheran Church in Helen Township, rural Glencoe, and was confirmed in his faith as a youth on March 25, 1945, by the Rev. Alfred Streufert at First Evangelical Lutheran Church in Glencoe. He received his education at a country school. He entered active military service in the U.S. Army on Dec. 16, 1953, and was honorably discharged on Jan. 19, 1956. On Dec. 3, 1955, he was united in marriage to Yvonne Betty Gibson by the Rev. Meyer at Trinity Lutheran Church in St. Louis, Missouri. After his military service ended, the couple made their home in New Auburn Township on the Schauer family farm. Their marriage was blessed with two children, David and Diane. They shared over 58 years before Mrs. Schauer’s death on Dec. 28, 2013. Mr. Schauer was a farmer and enjoyed tending to the animals, especially the cattle and hogs. He was an active member of First Evangelical Lutheran Church in Glencoe, where he served on many committees. Mr. Schauer was a hard worker. He enjoyed building and fixing items, fishing, and was an awesome storyteller, always had a joke to share. He cherished the time spent with family and friends. He is survived by his children, David (Judy) Schauer of Glencoe and Diane (Randy) Rettmann of Glencoe; grandchildren, Tara (Justin) Wisch of Brownton, Crystal (Michael) Cooley of Fort Collins, Colorado, Mike Schauer (girlfriend Kayla Erickson) of Glencoe, Cathy Rettmann of Glencoe and Dan (Chelsey) Rettmann of Fairfax; great-grandchildren, Ava, Wisch, Maddox Wisch, Isaac Wisch and Easton Wisch; sister-in-law, Dorla Butler of St. Louis, Missouri; and nieces, nephews, other relatives and many friends. He was preceded in death by his parents, Henry and Lydia Schauer; wife, Yvonne Schauer; brother, Raymond Schauer; and an infant sister.